1 Why do we need Fast Track Networks? Rudolf Niessler DG REGIO/ Director Policy Coordination RAPIDE in Action 24 March 2010. 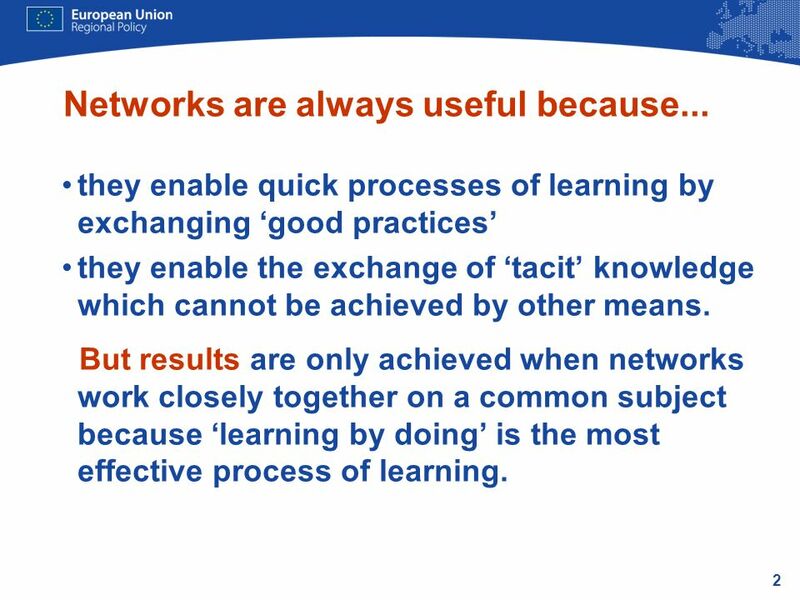 2 2 Networks are always useful because... they enable quick processes of learning by exchanging good practices they enable the exchange of tacit knowledge which cannot be achieved by other means. But results are only achieved when networks work closely together on a common subject because learning by doing is the most effective process of learning. 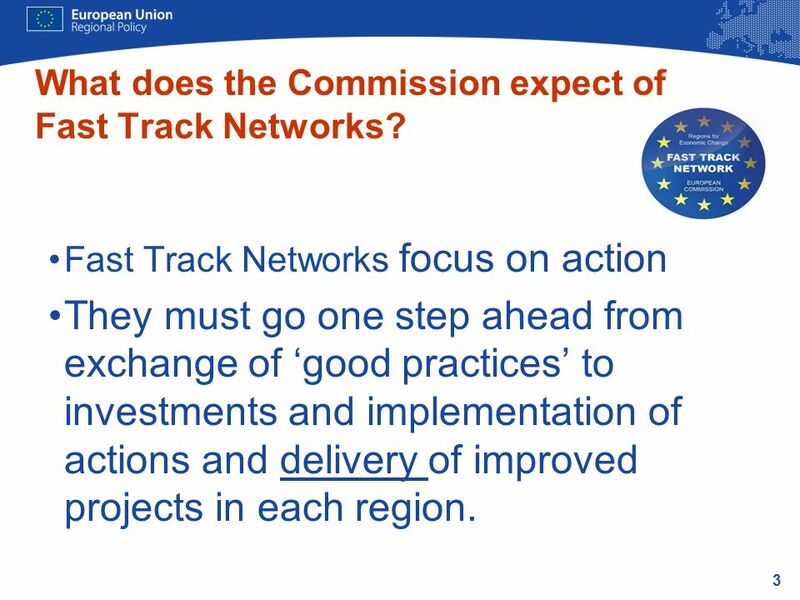 3 3 Fast Track Networks focus on action They must go one step ahead from exchange of good practices to investments and implementation of actions and delivery of improved projects in each region. 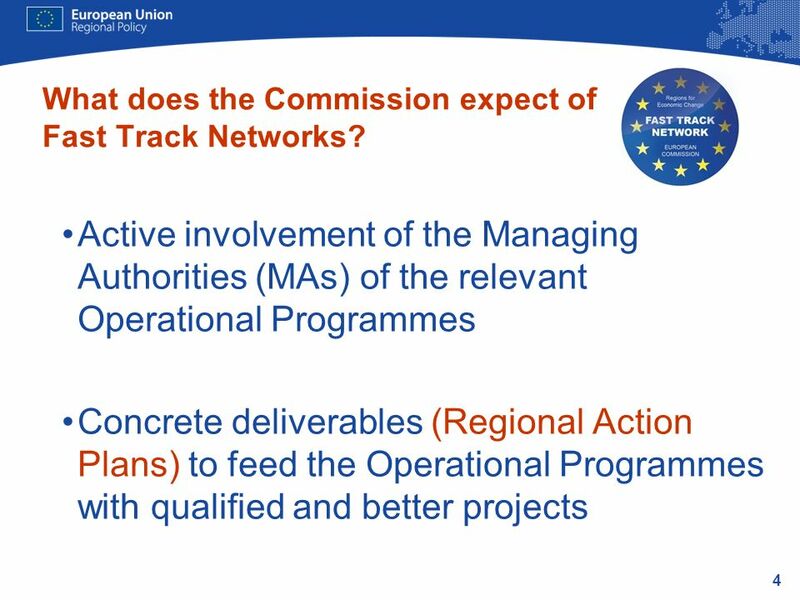 What does the Commission expect of Fast Track Networks? 5 5 What makes the Fast Track Networks different? 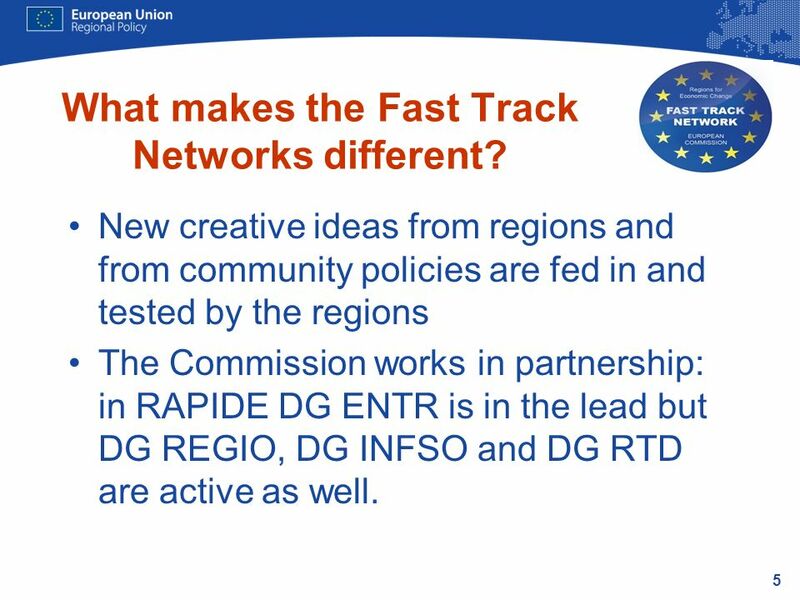 New creative ideas from regions and from community policies are fed in and tested by the regions The Commission works in partnership: in RAPIDE DG ENTR is in the lead but DG REGIO, DG INFSO and DG RTD are active as well. 6 6 What makes the Fast Track Networks different? 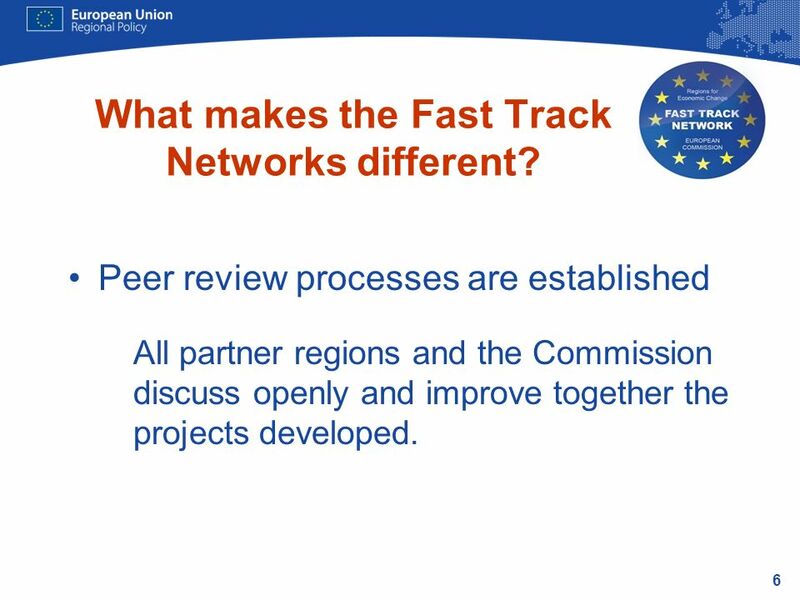 Peer review processes are established All partner regions and the Commission discuss openly and improve together the projects developed. 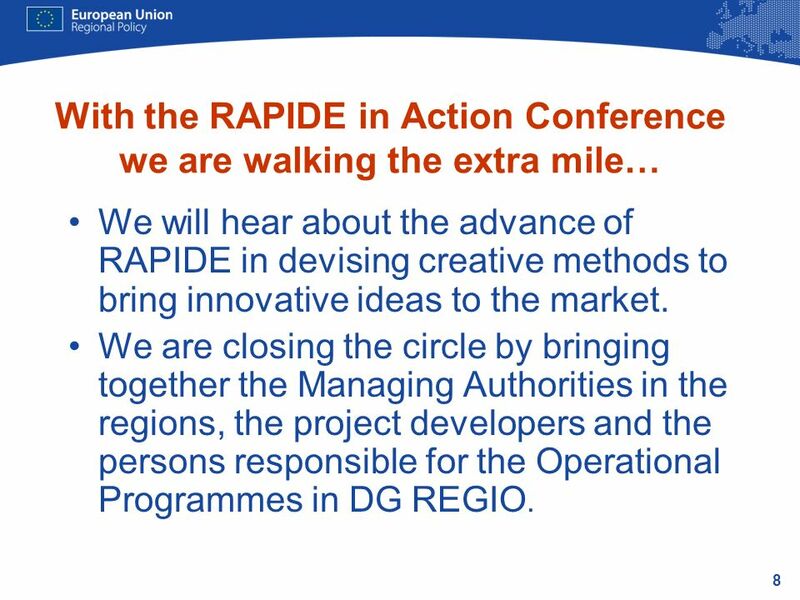 8 8 With the RAPIDE in Action Conference we are walking the extra mile… We will hear about the advance of RAPIDE in devising creative methods to bring innovative ideas to the market. 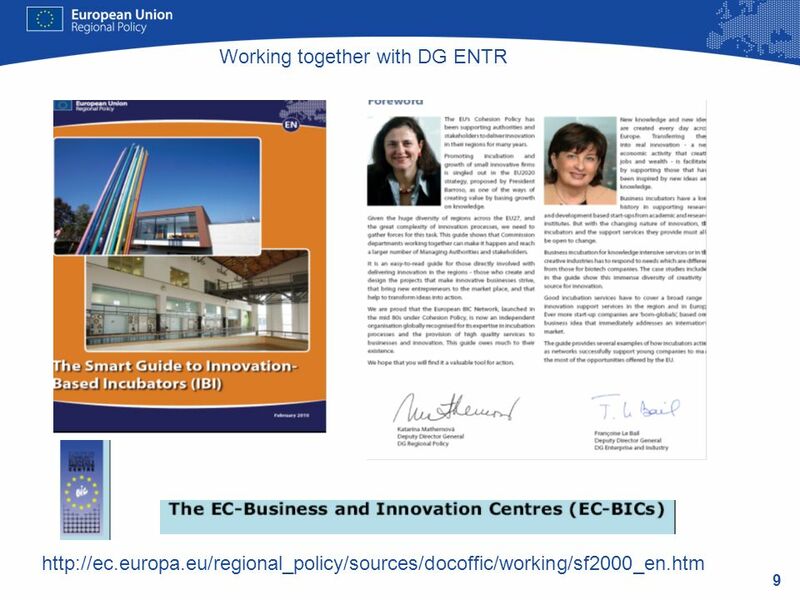 We are closing the circle by bringing together the Managing Authorities in the regions, the project developers and the persons responsible for the Operational Programmes in DG REGIO. Download ppt "1 Why do we need Fast Track Networks? 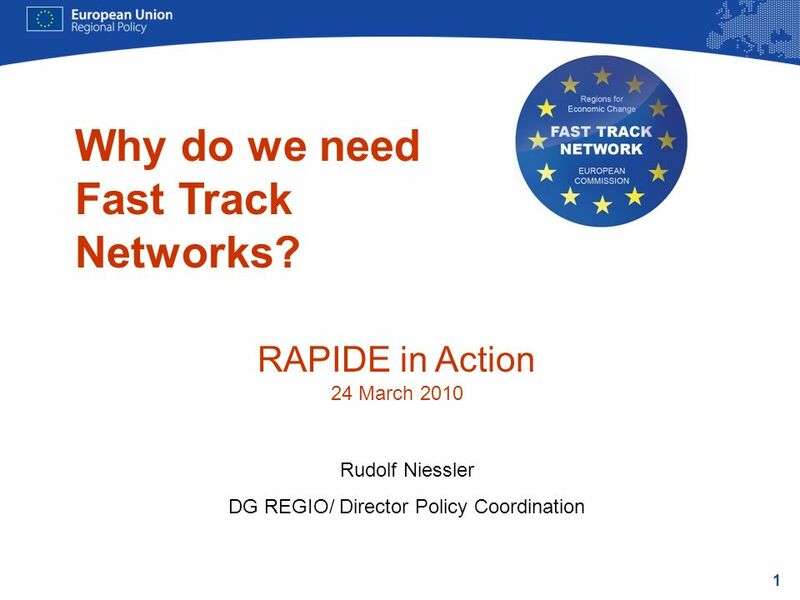 Rudolf Niessler DG REGIO/ Director Policy Coordination RAPIDE in Action 24 March 2010." 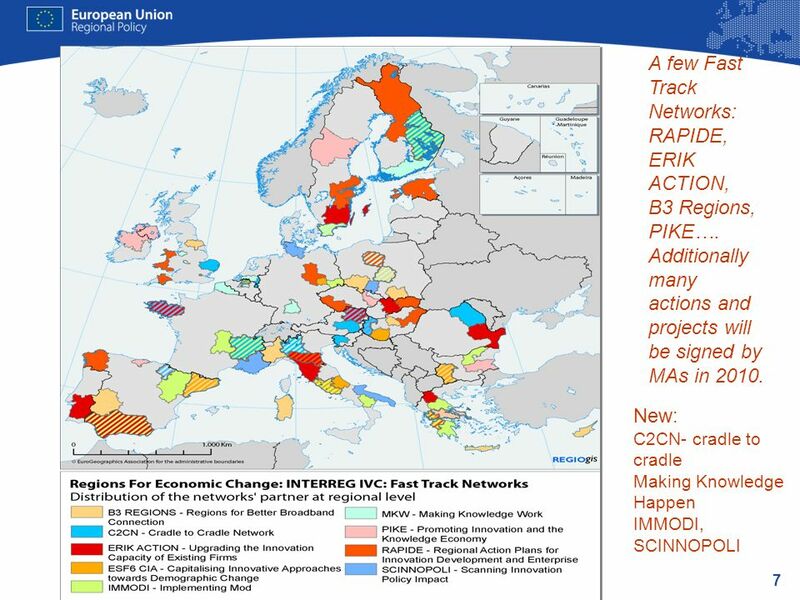 European Commission Enterprise and Industry Title of the presentation | Date | # What Fast Track means for RAPIDE Regional Action Plan for Innovation and. 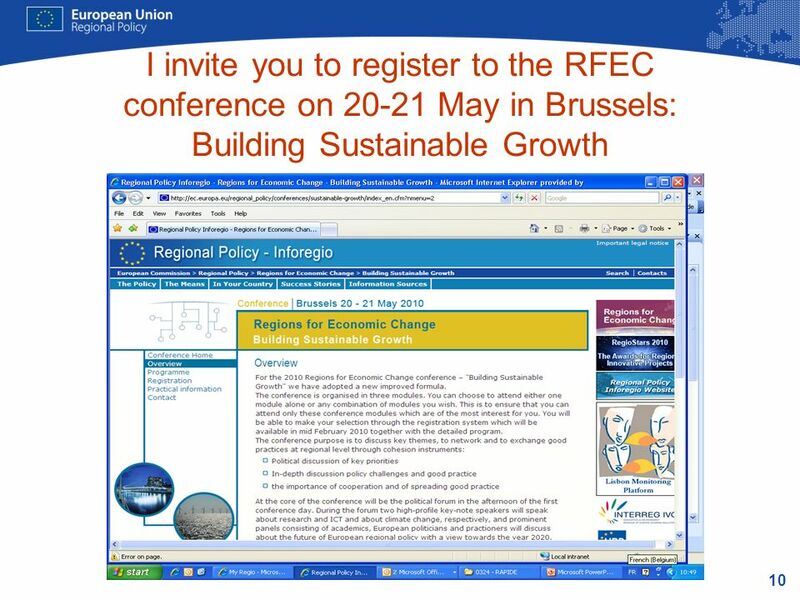 1 EUROPEAN REGIONAL DEVELOPMENT FUND 1 INTERREG IVC state of play RAPIDE final conference 15 & 16 June 2010, Magdeburg, Germany. 1 Brussels, 18 October 2007 Erwin Siweris INTERREG IIIC/IVC JTS Lille, France. European Commission European Union Delegation in Washington Dr. Aires Soares The current International Cooperation on Science, Technology and Innovation. 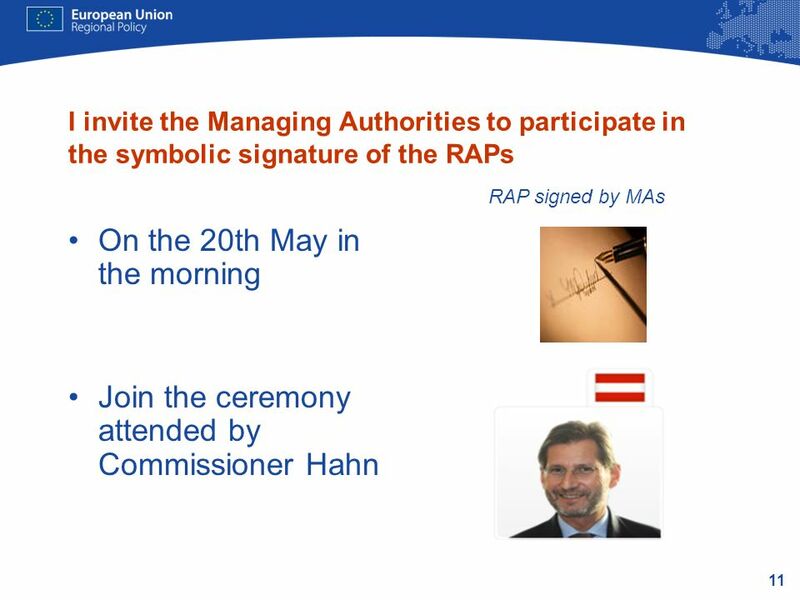 Kick-off event 09 December 2011, 10:00, Committee of the Regions Welcome by Gerhard Stahl and Nicholas Martyn Evaluation of OPEN DAYS thematic. Investing in Europes future Gathering participants, the OPEN DAYS is the annual key event for EU, national, regional and local. 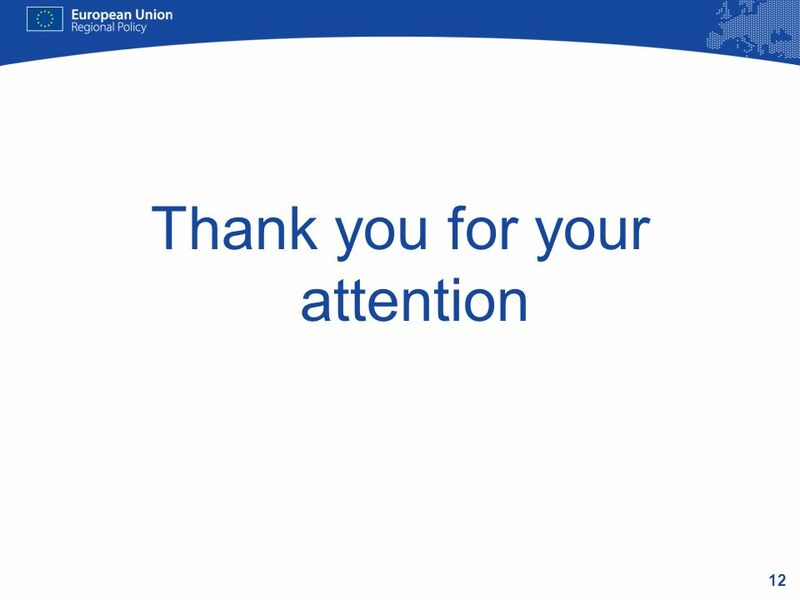 > Contents 1 EUROPEAN REGIONAL DEVELOPMENT FUND INFORM - Brussels, 16 June Nuala Morgan, Communication Officer. Stimulating the demand for innovation – Futuris Conference April 1st 2009 Henriette van Eijl Coordinator, Lead Market Initiative EC, DG Enterprise, Innovation. Fifth Progress Report on Economic and Social Cohesion Danuta Hübner. 1 Workshop I - Introduction: Monitoring and evaluation (M+E) financial engineering instruments for SMEs 5 th Plenary Meeting JEREMIE Networking Platform. Managing authorities working with cities Regions for Economic Change 17 th February 2009 Peter Ramsden Pole Manager.